Quitting smoking can be hard. Champix® works by reducing your withdrawal symptoms and by stopping the addictive effect of nicotine. Champix® does not contain nicotine. Champix® has been proven to significantly increase your chances of quitting smoking. To place an order, start our consultation below and fill in our brief questionnaire. Our doctor will review your information and write a prescription for an appropriate treatment. Orders received before 4pm will be processed and sent out the same day. Orders received after 4pm will be sent out the next working day. You will receive your prescription via post. There are suggestions that in rare cases Champix® can cause depression or suicidal thoughts. If you feel like this you should stop taking Champix® and contact us via your patient record. If it feels like an emergency, contact your nearest A&E department. Nicotine replacement therapy (NRT) is a common alternative aid to help you quit smoking. NRT comes in a number of forms like patches, sprays and lozenges. You could also try acupuncture, hypnosis, or going 'cold turkey' (e.g. with no aids, just using will power). Champix is a popular treatment to stop smoking. Champix contains varenicline, which imitates the effect of nicotine (the drug in tobacco that makes it addictive). Champix works by stimulating the receptors in the brain that respond to nicotine, so you’ll get fewer withdrawal symptoms when you stop smoking. You begin taking Champix a week before you want to stop smoking. This gives it a chance to build up in your body, so that by the time your body starts to feel withdrawal symptoms Champix has already taken effect. Usually you’ll start with a lower dose and then build it up and the treatment will last for roughly 3 months, but follow your prescription. Most people don’t experience side effects, and if they do they are very mild – they can be lessened further by taking Champix after a meal. Champix tablets should be taken at the same time every day. The standard treatment duration is 12 weeks. However, your doctor may decide to extend your treatment if necessary (provided you have stopped smoking). If you ever forget a dose, just take it as soon as you remember, then continue treatment at the correct time. If it is nearly time for the next tablet skip the dose you missed - do not take a double dose to compensate for a missed tablet. Although Champix tablets can be taken by most smokers who want to quit, it is not suitable for everyone. Before taking Champix, you must discuss your medical history with a doctor. When you buy Champix from Superdrug, make sure you fill in our brief medical questionnaire and provide the correct answers, so our doctor can assess whether you can take the tablets. It is particularly important that you mention if you have ever suffered from a mental health issue such as depression. It is not unusual for smokers who quit to experience symptoms of depression. The same applies when stopping smoking with Champix tablets. If you experience symptoms of depression or have suicidal thoughts during your smoking cessation treatment, seek medical help immediately. You must not take Champix if you are allergic to any of the ingredients, for example the active substance varenicline. You should also tell the doctor if you have had problems with your heart, a stroke, or seizures/epilepsy. Champix is not suitable for women who are pregnant or breastfeeding. Champix, and stopping smoking, may affect the way your body responds to other drugs. Please tell your doctor about any other medications that you are taking. You should not take Champix with other medications for stopping smoking. For a full list of all risks and recommendations, read the Champix patient leaflet supplied with your stop smoking tablets. Champix can cause side effects in some patients. You may also experience symptoms of withdrawal. For a full list of all Champix side effects, please read the patient leaflet. Very rare side effects include depression, agitation, suicidal thoughts, heart problems, stroke and seizures. If you are worried about any of these, stop your treatment and contact a doctor urgently. There have been reports of altered mood in people taking CHAMPIX. If you feel agitated, depressed, or have suicidal thoughts, you must stop the treatment and seek medical attention urgently. If you have previously suffered from any psychological problems, you should tell your doctor before taking this medication. Smoking is responsible for more premature deaths in the United Kingdom than any other disease. Over 6 million smokers are looking for ways to stop. NICE guidelines (the National Institute for Health and Clinical Excellence) state that Champix and Zyban and nicotine replacement therapy are amongst the most effective treatments. Ordinarily, treatment with Champix or Zyban lasts approximately four weeks. Zyban is less effective than Champix, but it can still double the chance of you stopping smoking. Like Champix, Zyban reduces the withdrawal symptoms when you stop smoking and has few side effects. You can also get nicotine nasal sprays and mouth sprays on prescription. There are also non-prescription treatments available. These include nicotine patches, gums and lozenges which focus on reducing the craving for nicotine with an ongoing dose of the drug. There are several non-medical and alternative treatments that you could also try to stop smoking. These include: acupuncture, hypnosis and smoking cessation support groups and programs. One in two people on programmes that offer NHS support, therapy, self-help skills and nicotine withdrawal medications succeed and stop smoking as a result. If you smoke ten cigarettes a day, it costs £113.45 a month. That’s £1361.45 a year. If you smoke twenty cigarettes a day, it costs £226.91 a month. That’s £2722.90 a year. 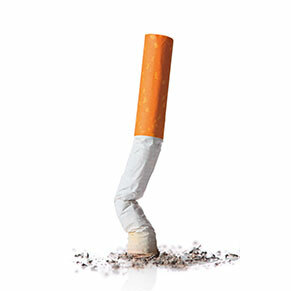 If you smoke forty cigarettes a day, it costs £453.82 a month. That’s £5445.80 a year.